CRN has refitted the 46-metre Eight, which launched as Saramour at the yard in 2005. It marks the first refit by the yard of one of its own yachts. The original yacht featured exterior stying by Nuvolari Lenard. Eight’s new owner has decided on a dark blue hull to replace the original white, but the main focus of the refit has been the interior, where some partitions have been removed to increase brightness and enhance the connection with the outside areas. 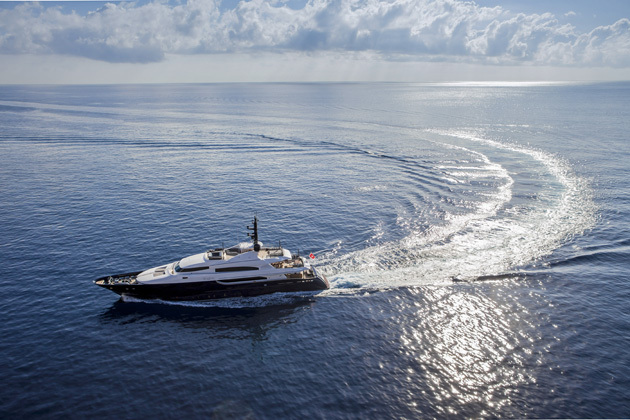 The interior of the CRN Eight has been reconfigured by Solido Interiors. The main-deck aft has four dark grey sofas, while inside the media area boasts a 78in Samsung TV, which acts a division between the lounging areas and the round dining table that seats ten. All windows have been enlarged and a new lighting system has been installed. Forward is the owner’s area, with an office studio space leading to the suite. A colour palette of light browns and creams creates a warm and relaxed feeling. There are four guest suites on the lower deck, with the fourth of those cabins replacing the original fitness room. The aftermost cabin is a full-beam VIP. In the reconfigured sky lounge, there’s a C-shaped sofa around a 75in TV, and then dining outside for ten.